These golden balls are a very popular street snack in India. The one rule of eating out in India is that if it’s fried, hot, and spicy, you’re probably good to go. Oh, and always follow the crowds. That won’t be too difficult where these batate wade or potato dumplings are concerned. It’s one of Mumbai’s signature dishes and you will find yourself following your nose and a stream of people in search of your next fix. 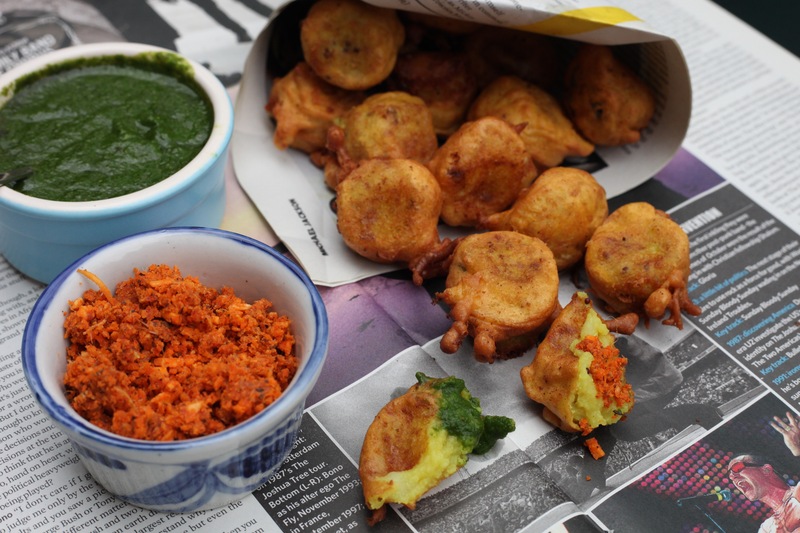 My mum and grandmum used to try and wean us off eating street food by making these at home, accompanied by generous lashings of garlic chutney that’s an integral part of this dish. As much as I enjoy these when I am in the mother city, I need to have my quick fix when I’m homesick and the cravings hit hard. So, here’s my version of a classic. I hope I can do it justice. Heat the oil until it is really hot. Add the mustard seeds, garlic, chillies and curry leaves. When they crackle and splutter, take this off the heat. Add the turmeric and swirl it around in the oil. Pour this fragrant oil into the potato mash while it is still warm. Add the salt. Now make the batter. Add the turmeric, chilli powder, salt to the besan. Mix well. Now grease your palms and divide the mash into evenly round balls. Heat your frying pan and add enough oil to deep fry the batate wade. The balls need to be submerged in the oil. Dip each ball of the mash into the batter and add them to the frying pan. Each wada needs its own space in the pan so add fewer than you think can fit into it. When they turn golden and crunchy, take them out onto paper towels that can soak up excess oil. Serve hot with generous portions of chutney. Green chutney is fine but the fiery garlic one is what will establish your credentials of being a true blue Mumbaikar. This entry was posted in A-Z 2016, Batate (Many ways to cook potatoes), Savoury snacks, Teatime snacks or Brunch ideas, Vegan and tagged #AtoZchallenge, batata wada, batatewade, epicurious, garlic chutney, lahsun chutney, mumbai street food, Mumsnet Blogging Network, potato mash, Yummly. Bookmark the permalink. Masta ekdum my all time favorite street food. My A-Z challenge blog link is below.The one that appears here is my food blog. You are welcome to visit both. Thanks for visiting, Kavita. Look forward to catching up on your posts. All time favorite street food.